After the 1976 presidential campaign had dragged to a conclusion, Tom Wicker published a column in the New York Times titled, “Do We Really Need The Debates?” Considering he had to ask the question, it’s not surprising that his answer was “no.” Looking back on the ‘76 debates, Wicker expresses amazement that they were decided on “such thin stuff” as Ford’s foreign policy stumble in the second debate. He goes on to point out that debates are exclusionary beyond the two major parties, make a mockery of equal time laws and other campaign regulations, lower journalism as a profession by placing the campaigns in a position of authority, and reduce political discourse to insults and misleading contortions of fact. Those complaints are nothing new, and clearly aren’t unique to debates—every one of those criticisms has been made about the current electoral cycle in the last two weeks. But the timing of Wicker’s argument, coming just after only the second cycle of televised presidential debates, is important. The seeds of the disastrous 2012 primary debates, with all their circus-like qualities, had already started to bear fruit (bear with me on the mixed metaphors). During the 1980 election cycle, that process had moved ahead substantially, as the campaigns learned how to play the debate game. Contrasting with Wicker’s dim assessment of the debates, the Times also reported on an outside group that advocated for debates becoming a regular part of campaigns. Although the report by Twentieth Century Fund acknowledged some of the problems of the debates, it concluded that seeing the candidates perform under pressure outweighed the negatives. Both Wicker and Twentieth Century Fund would see their respective positions on debates put to the test as the 1980 debates heated up, teaching Americans one lesson: the importance of a good zinger. Politics in its current form was coming together, but until the debates the 1980 race actually seemed all too familiar to President Carter. A struggling first-term president presiding over a poor economy faced a tough reelection campaign. A seemingly extreme nominee who had been governor of a large state had clinched the other party’s nomination by coasting on outsider charisma and made the incumbent nervous. Only this time, Carter was being cast as the ineffectual president running against the conservative juggernaut: former California governor and movie star Ronald Reagan. Many elements indicated how tenuous Carter’s position was going to be as the general election heated up. High unemployment, inflation, and interest rates plagued his presidency. In addition to the poor economy, the Iran hostage crisis made Carter appear ineffectual and unable to handle the duties of the presidency. He had to face a serious primary challenge from Ted Kennedy, who came close to beating him but lost in a rules fight at the convention. Carter’s ensuing bid for Kennedy’s endorsement led to a 1980 platform that largely catered to Kennedy, and in some cases directly opposed Carter’s record as president. Depending on your political beliefs Reagan was a saint, or at least a highly skilled politician, but back in 1980 he was viewed as a pretty extreme conservative in the Barry Goldwater model. George H.W. Bush, his main rival in the primaries, called his supply-side policies “voodoo economics” (feel free to chuckle darkly when comparing Reagan’s tax increases to the modern Republican Party). Even when pitted against a field of other Republican candidates, Reagan distinguished himself as a master of the debate format. 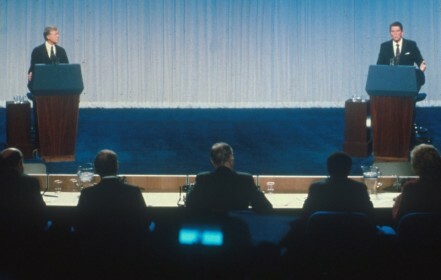 The primary debates in February 1980 presented a sneak preview of both Reagan’s raw political talent and the way his one-liners would play in the general election. At the beginning of the second debate of the 1980 primaries, the campaigns fought over the format—at Reagan’s instigation. As the candidates and operatives clashed, the moderator ordered Reagan’s sound cut off. Reagan grew angry at what he perceived as a slight against him, and responded forcefully with the now famous line, “I am paying for this microphone.” The crowd reacted with uproarious applause, and Reagan locked up the nomination. Why did Reagan’s remark stick so powerfully for Republicans? It was the type of off the cuff moment that voters like to think captures the essence of a candidate. Those can often be the most powerful and damaging parts of campaigns—consider Mitt Romney’s $10,000 bet, or his declaration that “I’m running for office for Pete’s sake!” Not only did it provide an opportunity for voters to see the “real” Reagan, it tapped into the ideology Reagan was advocating and connected with voters on a deeper level. Conservative voters, angry at what they perceived as bloated government spending, wanted to reclaim ownership of how their tax dollars were spent. It also, however, explained why there was some good news for Carter in the summer of 1980. The poll numbers indicated that the incumbent was holding on at 39 percent to 32. Moderate Republican Illinois congressman John Anderson was running as an independent and sort of “anti-candidate,” who held 21 percent of the vote. Though Reagan had ignited a conservative fervor in the primaries (and attempted to reach out to moderates by selecting Bush as his running mate), independents and disappointed Carter voters were wary of what they perceived as his extremism. Considering the general electorate’s suspicion of Reagan, opting out of the first debate was a particularly poor decision on Carter’s part. The president refused to take part in the debate on principle because of Anderson’s participation as a third-party candidate. What might have seemed like a virtuous stand, however, proved disastrous. After all, beanbag etc. etc. Not only was Carter behind in the polls coming out of the conventions, without a serious candidate to counterbalance him, Reagan had free reign to dictate the nation’s opinion of him in the first debate. In fact, foreshadowing certain stories in the 2012 campaign, the Washington Post ran a headline that read, “Reagan, Anderson, Empty Chair.” Unlike Clint Eastwood’s Invisible Obama, however, Carter’s empty chair had a real effect on the race. Absences are important in television. In drama, empty space where a character should be can command as much power as their presence (if you don’t believe me, go back and watch “The Body”). Not so in presidential debates. As pundits like to say, there’s a certain amount of oxygen in any given contest and if most of it is being sucked up by one candidate, the others are screwed. Reagan was a considerable charismatic presence, and without serious, credible opposition, he became the most viable candidate for president on the stage. Still worse for Carter, without being present to defend himself, Reagan and Anderson could both paint an unflattering picture for the country. Even the presence of the other, relatively unserious candidate was problematic for Carter. Anderson was a more centrist Republican who had lost the nomination to Reagan and ran presenting an explicitly moderate alternative to both candidates. Anderson’s campaign strategy centered on disaffected Carter voters who might not go for the conservative Reagan. In fact, polls immediately after the debate suggested that Anderson had outperformed Reagan. While that might have been a function of low expectations for the independent candidate, it still indicated that an incumbent president might have been able to outperform both Republicans and come across as the adult in the room. The first debate also provides some insight into the ways television itself changes the manner in which we understand victory in debates. Soma Golden, a reporter with the Times who was one of the participating journalists in the debate, penned an editorial explaining her experience at the debate. What she wrote might be surprising. Though Anderson came off as shifty and indifferent on television, those present and close to the candidates found him thoughtful and forceful. Reagan, on the other hand, while appearing at ease (as usual) and lofty from afar, seemed more transparent, mere rhetoric, from close up. The ways the camera captures body language are the source of a common suggestion that pundits looking to predict who will win a debate in the court of public opinion should watch with the sound off. As the universe’s gift to me, there was only one debate in which both candidates participated. Anderson did not participate, presenting a showdown between the major candidates that, in the universe’s gift to screenwriters looking for plots for ‘80s sports movies, was held just a week before the election with incredibly high stakes, Adrian. Take a few minutes to listen to the Rocky theme and come back. Each candidate worked as hard as he could to define himself against opponent. That might seem like obvious campaigning, but Carter and Reagan seemed to immensely dislike each other. Carter viewed Reagan as an extremist; Reagan saw Carter as a failed big government liberal. The intensity of disagreement extended past personal matters to serious clashes on policy both foreign (Reagan wanted to get much tougher on the Soviet Union) and economic (Reagan advocated for tax cuts that he claimed would not stem the government’s ability to do its job). And each candidate brought his own personal style to the debate. Carter may have seem folksy in contrast to Gerald Ford, but in his discussion of oil shocks and inflationary pressures, he seemed hopeless wonky and incapable of communicating. It’s worth noting that Carter’s tone of voice and the general manner in which he delivered answers rarely changed, while Reagan displayed a full range of expression. Two moments defined the debate. The first was focused on actual policy, or lack thereof. Carter accused Reagan (rightly) of having opposed Medicare when it was originally being debated. Reagan’s response was a line he had practiced many times during preparation for the debate. “There you go again,” he said, as if it were the most natural, spontaneous reaction in the world. The substance of what Reagan said didn’t matter—the line, as with the microphones, crystallized voters’ opinions of Carter as ineffectual. He went on and on about policy questions that weren’t as important as Reagan’s commanding presence. Carter could only sputter. Reagan would go on to reuse that particular response, but we’ll get to that later. In his closing statement, Reagan asked the American people a question that has resonated for over two decades: “Are you better off than you were four years ago?” In some sense, that question is at the core of presidential elections: has that president’s administration demonstrably improved the lives of the American people? That can be harder to answer in some cases (witness the debate over that very question in this election), but at least in 1980, it seemed clear to many voters. “Are you better off?” broke down along the major policy lines—unemployment, safety—that hurt Carter and catered to Reagan’s strengths. Much like the 2012 election, the incumbent Democrat’s strategy was to portray the election as a referendum on the radically conservative challenger rather than on his own policies. The sensible framing of Reagan’s question made that messaging impossible for Carter, and contributed to the deluge of support that widened Reagan’s support until he blew Carter out of the water on election day. Again, the takeaway from the 1980 debates is that single, iconic lines can actually move polls by shaping perceptions of one candidate or another and by snapping into place the ways undecided voters think about their ballots. Carter had his own attempt at memorable connection with voters. At the end of a debate on nuclear weapons policy, Carter said that he had “had a discussion” with his daughter, Amy, who reportedly believed nuclear weapons were the most important issue in the election. But Carter wasn’t nearly as believable as Reagan. Where Reagan’s prepared remarks sounded like fast and genuine reactions to Carter, the “Amy speech” was clearly canned, seemed out of touch, and had minimal relevance to what was going on in the debate. She thought nuclear weapons? Really? The use of canned lines cut both ways, lifting Reagan and hamstringing Carter. Reaction to the debate proved yet again that policy questions are ultimately secondary to the ritual. The Times reported a stalemate, with stark contrasts between the candidates but no clear winner. Indeed, many commentators felt Carter had won the exchanges from a policy perspective. But Reagan was relaxed, comfortable, and came off as the candidate who was more at ease with the presidency. In the week between the debate and the election, the polls showed Reagan’s lead had increased enormously. Indeed, in the 1980 debate, turning off the sound would have made it much easier to predict the winner with voters. Here’s the kicker: Kurtz went on to note that the Reagan camp had obtained Carter’s debate materials. Reagan’s personal charisma and comfort aside, sometimes the best crafted spontaneous answers just come from cheating.